Chemflo Pumps by MP Pumps 1, 2, 3 & 4, 316 SS centrifugal pumps. Investment cast 316 SS has stronger and more corrosion resistance capabilities than 304 stamped stainless. Viton shaft seals are standard for continuous duty. Require 56C face electric motors. Available in 1-1/2"x1" and 2"x1-1/2" NPT. Drop Ships from factory in 7-10 business days. MP Pumps Chemflo 1, 316 Stainless Steel Centrifugal Pumps # 30885. Up to 100 GPM, pressures up to 130 feet in head, 3500 RPM, 1-1/2" x 1" suction & discharge, 316 stainless steel construction weight 51 lbs.Drop Ships from factory in 7-10 business days. MP Pumps Chemflo 2, 316 Stainless Steel Centrifugal Pumps # 31048. Up to 110 GPM, pressures up to 103 feet in head, TDH (Head) Maximum @ 0 GPM 45 PSI 3500 RPM, 1-1/2" x 1" suction & discharge, 316 stainless steel construction. weight 51 lbs.Drop Ships from factory in 7-10 business days. MP Pumps Chemflo 3, 316 Stainless Steel Centrifugal Pumps # 30708. Up to 125 GPM, pressures up to 105 feet in head, TDH (Head) Maximum @ 0 GPM 46 PSI, 3500 RPM, 2" x 1-1/2" suction & discharge, 316 stainless steel construction. weight: 51 lbs.Drop Ships from factory in 7-10 business days. MP Pumps Chemflo 4, 316 Stainless Steel Centrifugal Pumps # 30628. Up to 180 GPM, pressures up to 78 feet in head, TDH (Head) Maximum @ 0 GPM 34 PSI, 3500 RPM, 2" x 1-1/2" suction & discharge, 316 stainless steel construction. weight 51 lbs.Drop Ships from factory in 7-10 business days. Yes it will..... If you start the motor too many times, a buildup of heat can cause damage to the motor. Every time the motor starts, the inrush current of up to 10 times the nameplate amps (locked rotor code M). The motor dissipates the inrush of energy as heat. 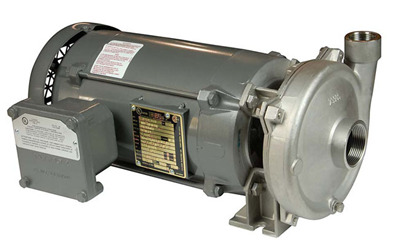 Do not let a centrifugal pump operate for long periods of time at zero flow. The friction of the impeller will make water will boil, the mechanical seal will "burn", all plastic components will melt and water will possibly leak into the motor windings In residential systems, the pressure switch shuts the pump down when the pressure is high which means there is low or no flow.